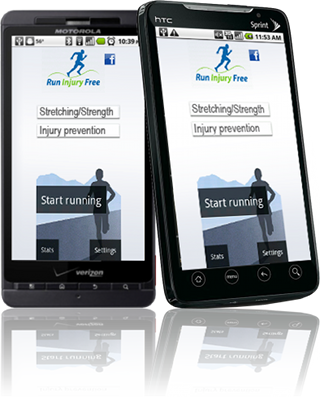 RunInjuryFree is an iphone app and it's also coupled to a web app to track your training, routes and achievements online. RunInjuryFree, a new iPhone app, delivers motivating training sessions as well as the knowledge of sport medicine professionals straight in the phone. Map your runs with your GPS and focus on your performance and health. 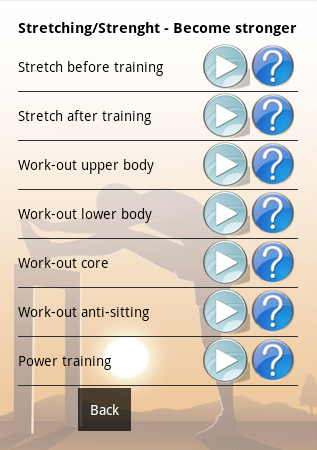 The app offers state of the art warmup and stretching routines as well as diverse training options. Monitor your progress and learn how to become a stronger runner thanks to our howtos and illustrations. Furthermore the app will diagnose your symptoms and help identify a running injury before it happens and then offer preventative measures and cures. A very useful app for runners at all fitness levels, from marathoners to chubby morning joggers. 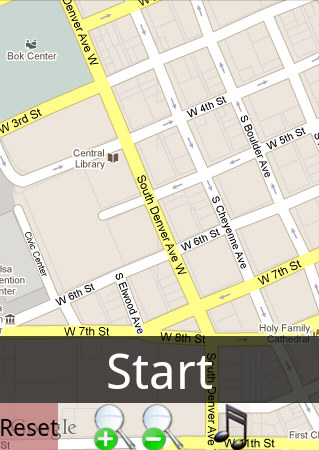 Full-featured GPS running app focused both on your performance and on your health as a runner. Become stronger and better balanced by stretching and working-out. These exercises have been chosen especially for runners by sport medicine professionals: learn about the stretching exercises useful before and after training, cross-training workouts and power training. 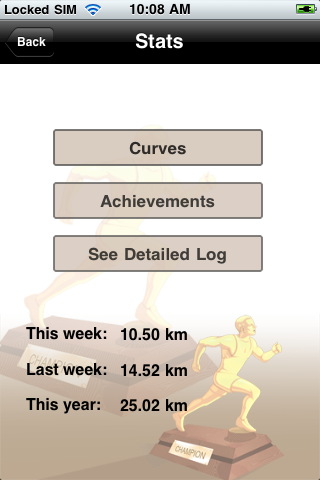 See progress curves, best achievements and detailed log of all your training. Instructive! Share your accomplishments to the world via Facebook and Twitter. Help you to diagnose your injuries and provide best practice advice to accelerate recovery. Special tool to log your recovery. Covering all common feet, ankle, achilles tendon, shin, knee, hip&back problems. Featuring many recovery advices, necessary stretching with 50+ illustrations. 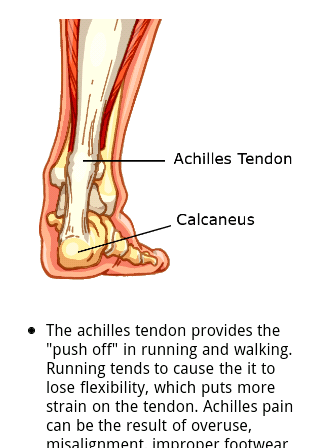 Stop having running injuries. Learn the basic rules to dramatically reduce the risk of injuries. Warm-up exercises. Perfect before training or competition. It is about dynamic movement to increase your functional range and make your body temperature high. Important! Stretching. After training, it is time for controlled, static stretching. Perfect to do it in front of TV and it will help you relax your muscles group in the short term and increase general flexibility in the long term. Strength training for upper body increases respiratory efficiency and body stability. It will help improve performance and help prevent injury. Develop your lower-body strength to reduce risk of injuries due to muscular imbalance. It will also boost your general performances. Core conditioning is about activating your important stabilizing muscles to improve your efficiency of movement. Sitting on that chair all day tighten muscles. You can reverse the imbalances that sitting causes using these simple stretches and strengthening exercises. Power training will help you maximize your stride power. It will increase your running economy by increasing the stiffness of your stride. More floating and shorter ground contact time is the goal. Walk/run for you who has just started with running and needs to get in shape progressively. Alternate running and walking and watch your endurance increase. Also perfect for athletes recovering from an injury. How long can you run now? How long do you want to be able to run? 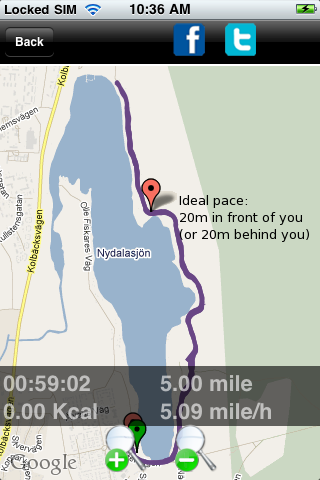 Pace training mode to better reach your goal for a race. Target an average pace and make sure you reach your goal. You get visual and audio feedback live during the race. You will learn more about pacing and your racing possibilities. Interval training mode to train for speed. The secret to become faster and stronger runner is to do interval training once a week. Beat yourself mode to achieve always better performance Motivational!. Pick a log of your best run and see if you can beat it. In real time, you will know how good you are doing. Your "ghost" is shown as a yellow pin. Warmup&Cooldown routines are integrated in the running experience. The iOs app is compatible with iPhone 3GS, iPhone 4 running iOS 3.0 or later. Some features such as Map and Share require users to be connected to a wireless network for full functionality. Please note that continued use of GPS running in the background can dramatically decrease battery life.